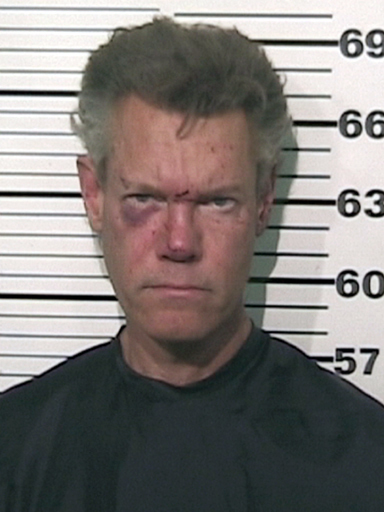 Randy Travis was charged with driving while intoxicated and threatening law officers after the country singer crashed his car and was found naked and combative at the scene, Texas officials said Wednesday. A photo released by the Grayson County Sheriff's Office shows a battered-looking Travis in a T-shirt, with a black eye and dried blood on his face. He later walked out of jail on $21,500 bond wearing scrubs, a University of Texas ball cap and no shoes. The sheriff's office received an emergency call just before midnight Tuesday about a man seen lying in a road west of Tioga, where the singer lives. Sheriff's Sgt. Rickey Wheeler said Travis faces charges of retaliation or obstruction in addition to driving under the influence. "Travis had a strong odor of alcoholic beverage on his breath and several signs of intoxication," according to a statement from the sheriff's office. "While Travis was being transported, Travis made threats to shoot and kill the troopers working the case." He also has been involved in messy court proceedings with his ex-wife. Travis was divorced from Elizabeth Travis in 2010 after 19 years of marriage. Randy Travis countersued in May, accusing his ex-wife of divulging confidential information about him in order to damage his reputation and career. The court documents don't say what information Elizabeth Travis is alleged to have betrayed.